In this post I will work on the weathering effects of the color texture, while in the next one I will add scratches and some other remaining details. These photos were taken by Frank Sherschel on 14th November 1942, for the “Life” magazine. 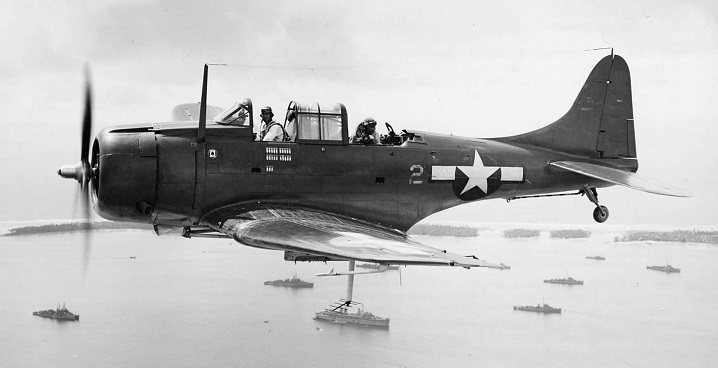 The SBD-3s depicted on the pictures belonged to VMSB-241 squadron, stationed at Midway in that time. Marines received these aircraft in July 1942, but all of them were already used before – most probably on the U.S. Navy carriers. I think that in November 1942 these SBDs had accumulated about 10-11 months of the war service. I will use them as an extreme case of the weathering. (It is always good idea to recreate such an ultimate case in the texture, because you can always make your model “newer” by decreasing intensities of the weathering layers. On the other hand, you cannot use more than the 100% of their intensities, thus you cannot make your model “older” than you initially painted). Originally I was going to describe the finished bump map in this post. However, when I started writing it, I discovered that I have enough materials for at least two subsequent posts. Thus I decided to split this text into this and the next article. There are many small openings in the aircraft skin. 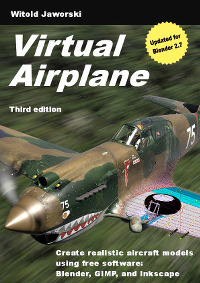 For example ­– perforation of the SBD Dauntless wing flaps, or small slots for control surfaces actuators. It would require a lot work to model each of such details “in the mesh”. What’s more – it would make the model meshes much more complex, which would hinder the UV mapping, and so on. As you can see in figure above, the final result does not differ from the openings modeled “in the mesh”.